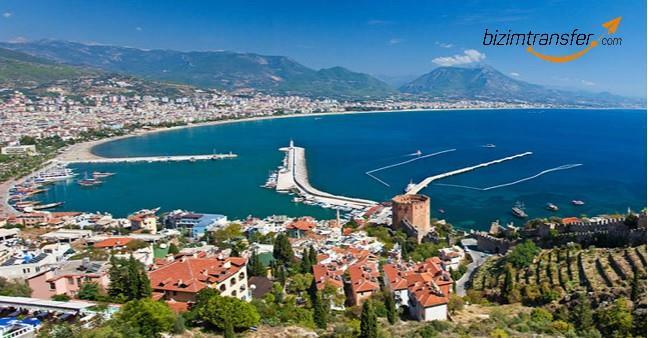 Home to "The Citadel", a 13th-century old structure with 150 well-preserved towers, Alanya is a modern resort-center with comfortable hotels, countless fish restaurants (fresh ingredients brought in daily), cafés and pubs. Cafés are the favorite gathering spot not only for the locals but also for the tourists. As you wander along the road that takes you through the scenic town park towards the coastal harbor, you will be greeted with many shops filled with clothes, jewelry, and leather goods. Do not forget to buy the bottles made out of hollowed out pumpkins, it is a local symbol and magnificent example of craftsmanship. You must visit the cave of Damlatas with its gothic, mysterious halls carved into the rock. The museums of archaeology and ethnography are also worth a visit. Take a boat ride to three picturesque marine grottoes: Ashiklar Magarasy, Fosforlu Magara (with luminous rocks - there is a high content of phosphorus in them hence its name) and Kyzlar Magarasy (where the pirates used to imprison their captives). Take a trip to the valley of Dime Kavi - it is just 15 kilometers outside of Alanya - enjoy its greenery and listen to the nearby stream. The 35-meter long tower Kyzyl-Kula is host to an ethnographic museum. The old fortress wall is 6.5 kilometers long and 250 meters above the sea level. The Citadel is a 13th-century structure with 150 well-preserved towers and a Byzantine church. Inside, the fortress "guards" a small ancient village, and at its center, the mausoleum of Aksebe is located. All of these are open to visitors and are a great example of Ottoman life and rule over the land. On the west, you can visit the museum of Alanya which has a collection of archaeological finds. Close by there is one of the most famous caves in Alanya, it is known as "The Cave of Dripping Stones," and its high salt vapors are claimed to be very medicinal, especially to those visitors who have asthma. Also, visit the beach of Cleopatra which is hidden between the rocks. It's worth taking a trip to Alanya in August, as the town invites its visitors to a colorful and eventful international festival of folklore. It is a wonderful event and has a very celebratory feeling to it, so do not miss out. Most of the hotels in Alanya have their own beaches on site, and this is very popular with the visiting families. The clean sands, fresh mountain air, and comfortable hotels as well many entertainments on offer make Alanya a desirable place to visit. No matter what your transport needs can be, Bizim Transfer is always at your service to take you anywhere anytime. Alanya transport is only ice cream of the crop. whether you are a group or shared or private, Bizim transfer drivers will meet you at the airport and drive you to Alanya quick and safely.